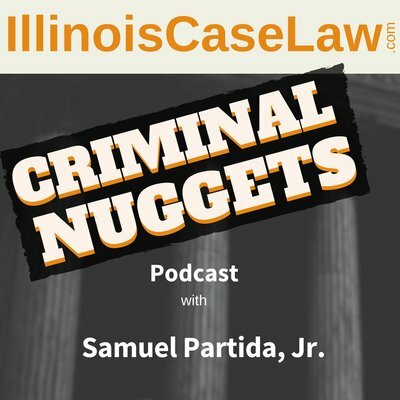 I created a mini Illinois case law review 2014. As you know, I have been reading, summarizing, and reporting on Illinois criminal case law for the entire year in 2014. I took the liberty to create a case list featuring the top 10 lawyer mistakes cited in 2014 Illinois criminal court decisions. decisions that jumped out and punched me in the face. I have this burning desire to let you know about these cases as well. People v. Perez, 2014 IL App 120978 (3d) (10/01/2014). This is the case with the lady who was in traffic court on a ticket. She is there all morning before the judge takes a break. A bailiff assigned to another courtroom hears Defendant and rats her out to the judge whose room she left. That judge then proceeds to ream the lady out and finds her in indirect criminal contempt of court. She was sentenced to 8 days in jail for the contempt. People v. Trzeciak, 2014 IL App (1st) 100259-B. The judge in this case completely berates a venoir member who was trying to get out of jury duty. He told the judge he could not be fair to the prosecution. Judge was so angry with him he punished him by making him wait around all day until the judge felt good and ready to let him go. You think the other potential jury members felt comfortable answering questions truthfully? People v. Barnes, 2014 IL App (1st) 120634. Ok, we can understand the zeal of a young prosecutor. This prosecutor was prosecuting an aggravated battery to a child case. It was a severe scalding. The child was too young to testify. Since the kid could not take the stand to testify, the ASA was not going to have a chance to show the wounds to the jury. No problem. Instead, the prosecutor slapped an exhibit label on the child and proceeded to admit the child into evidence. Then the jury was shown the injuries. The record does not reveal if the clerk then took the child into storage as evidence. The appellate court found this little tactic to be prejudicial to the defendant and reversed the conviction. Yes, there were pictures of the the injures already admitted into evidence. People v. Short, 2014 IL App (1st) 121262 (10/29/2014). This criminal defense attorney tried to fall on his sword. His post trial motion alleged he himself was ineffective because he failed to make his client’s intentions clear to the court. You see, the defense wanted to exclude other crimes evidence. When they lost all the motions in limine on the issue, their “plan” was to plead guilty to the counts involving the other crimes. This way the jury would never hear that evidence. Well, the judge read the instructions on the tainted count and informed the jury of that charge. The Defendant only plead guilty after the judge had so informed the jury. The normal Strickland analysis is appropriate. Here the judge, said, “nice try but you were quite clear.” What really happened is that the client changed his mind. Trial counsel is not ineffective just because the Defendant makes decision to his detriment. Finally, I mention People v. Guzman-Ruiz, 2014 IL App (3d) 120150. This was a post conviction petition that was granted because trial counsel gave sketchy immigration advice. Actually, trial counsel was quite accurate. He told his client that a conviction for possessing pounds of cannabis with intent to deliver meant an automatic removal from the United States. But also included his opinion and prediction that the feds were not likely to follow through with her removal. We have to stick to just the facts when we are advising on immigration consequences. Really, in the end, we don’t know what the feds will do with any particular case. If the code says there will be draconian results that has to be what we report.